I was born April 19, 1945, the same day that British soldiers in Germany pushed 13,000 decaying bodies into trenches with a bulldozer at a place called Bergen-Belsen. Eleven days later, Adolph Hitler committed suicide in a bunker in Berlin, and a week after that the war in Europe was over. Bodies being pushed into a mass grave in April, 1945, the month Bergen-Belsen concentration camp was liberated. As the Allies advanced over former German-held territory, they uncovered an unexpected horror: Nazi death camps like Bergen-Belsen in which millions of civilian men, women and children were murdered, including six million Jews and millions more Roma, homosexuals, Jehovah’s Witnesses, disabled persons, and political prisoners. To this day, the Nazi murder of those they considered “subhuman” is almost inconceivable. But the Holocaust did not begin with the gas chambers, it began with words. Jews have been subjected to hatred and religious persecution for much of the 2,000 years they resided in Europe. Martin Luther equated them to a plague or pestilence brought by the devil, and they were reviled as killers of Christ, ignoring the fact that Christ himself was a Jew. After the triumph of the Allies in World War I, Germany blamed the Jews for their defeat. I was raised a Protestant, took instruction in Catholicism, worked for a Lutheran organization, became a Scientologist, and last year attended the Bar Mitzvah of my grandson. Last weekend, at a Native American community festival in Dorado, California, I walked with others through white sage smoke—an ancient rite to purify the mind and body of negative spirits—and heard a prayer in Paiute. Within those religious traditions, I have met some very fine people. While no one is perfect, those who follow the teachings of a religion do have a moral compass, and—even if they transgress against it—have a standard of right and wrong. For, regardless of their tradition or religious principles, religious people at some level celebrate mankind as a spiritual entity, connected to God, engaged in a search for truth, a quest for a more peaceful and enlightened world. Religion does not have a monopoly on right conduct, but the very word “religion” comes from the idea of a connection and a binding to the concept of man as a spiritual being. Nazi propaganda stirred up preexisting prejudice against the Jews, and beginning in 1920, mass media was used to revile Jews, build support for new laws restricting Jewish liberty, and convince the public that Jews were the cause of Germany’s loss in the First World War, and subsequent economic collapse. In 1933, when Hitler became chancellor, mass media was employed to coalesce popular support for the regime and its campaign against its enemies and the Jews. For the first time, radio reached a national audience and this new communication medium—and government control of it—began to control the minds and reactions of the German people. Then, when the population was sufficiently inflamed against Jews and ready for an explosion, the war of words turned violent. A Jewish man in Paris killed a German diplomat. One source says it was the result of a lover’s quarrel, another that the assassin’s parents had been expelled from Germany. But whatever the cause, Goebbels and Hitler seized upon the event to order violent action against Jews and Jewish property. On November 9, 1938, they ordered the murder of Jews and the burning of Jewish property. The destruction was designed to appear as the result of spontaneous outrage, and the resulting violence destroyed more than 1,000 synagogues, caused the murders and jailing of thousands of Jews and the destruction of Jewish homes and cemeteries. Police were told not to intervene, fire departments told to stand down unless Aryan property was threatened, and the government seized the insurance payments and made the Jews clean up the mess. The so-called “Night of Broken Glass,” or “Kristallnacht” was the transition from intolerance and bigotry into Hitler’s “final solution”—the murder of 6 million Jews. It is religious intolerance, not religion, that leads men to violence. Today, religious bigotry and intolerance has found a voice on the Internet, social media and television. Antisemitism is alive and well in Europe with a recent poll showing that 25% of Europeans are anti-Semitic. 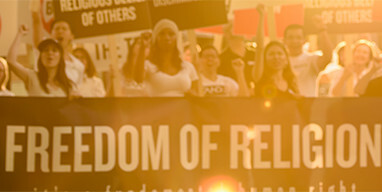 America itself has a long history of religious intolerance, and while the First Amendment keeps government from interfering with religious belief, individuals and the media are not so constrained. Propaganda, lies and deliberate distortions abound, stirring outrage and distrust. It is much more difficult for a public figure or organization to collect damages from media than a private citizen, because someone in the public eye must prove not just falsehood but malignant intent, so repeating lies and gossip without investigating them is “protected,” albeit unjust and unethical. So while religious bigotry is alive and well, we have no government sanction for it; we have a multitude of sources of information that disagree with each other; and we have direct access through religious home pages, Twitter feeds, Facebook pages and others to the truth. Judaism has the Anti-Defamation League to correct the lies, Scientology has Scientologists Taking Action Against Discrimination (STAND), Catholics have the Catholic League and there are others. There are few saints here on Earth, religious or otherwise, but there are those who would inflame the public against religions, set them against one another, and deny mankind’s spiritual nature. It is religious intolerance, not religion, that leads men to violence. It is hateful television shows like A&E network’s Remini Aftermath that attempt to stir bigotry and intolerance. If we’ve learned anything from Adolph Hitler and Joseph Goebbels, it is where unchecked intolerance and bigotry lead. Do not yourself become part of “…a vacillating crowd of human children who are constantly wavering between one idea and another,” but be a person who suspends the tendency to hate and approaches religion and other contentious subjects in a measured way, with tolerance and respect as the default, by going to the source, collecting and evaluating information until a rational, honest picture is attained. January 27th is Holocaust Remembrance Day, the day that in 1945, the Red Army liberated Auschwitz-Birkenau, the largest Nazi concentration camp. We know from history where unchecked bigotry leads. It’s now time to stand up for rational discourse and communication without the cheap shots and “stereotyped formulas” so prevalent these days in politics, race, sexuality, religion and other areas of life. Like Lincoln, we too can appeal to “the better angels of our nature,” and attain a better understanding of one another.